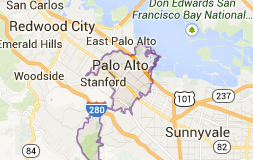 Palo Alto, "The land of the tall tree"
Home to some of the most famous high-technology companies, such as Hewlett Packard, Palo Alto also served as an incubator for companies like Apple, Facebook, Google or Pinterest. Ranked one of the most expensive cities in the United States, Palo Alto can be proud of its residents, among the most educated in the country. The school system is one of the best in the United States, and with the town's close ties with neighboring Stanford University, the future looks bright.